The story of Moses and the Brazen Serpent comes from the Bible (Numbers 21). God exiled the Israelites as punishment for their sins. However, they blamed Moses for their misery. In judgement, God sent poisonous serpents into their camp, which caused the people to repent. Moses prayed to God and received instructions to make a bronze serpent and set it up on a pole. When the people beheld the serpent they were healed, thus restoring their faith in God. Benjamin West, the first American artist to achieve international fame, made this drawing while preparing to paint the subject for a church in Barbados. Mia has a small but good collection of works by Benjamin West, including two figure drawings, his seminal lithograph of The Angel of the Resurrection, and three paintings. 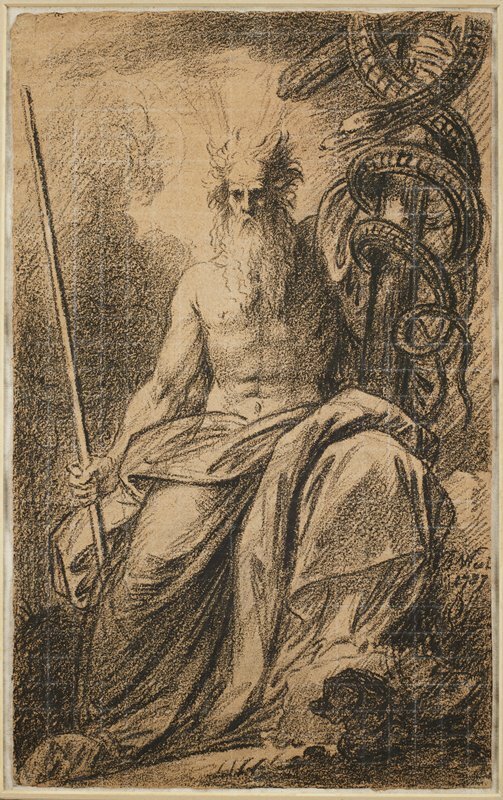 Moses and the Brazen Serpent also adds strength to our fine collection of 18th-century drawings.